After we made the decision to move back to Michigan we kept talking about how when we left Michigan originally that we had this misconception that somehow the grass was greener somewhere else for us. We thought things would be better in a city. We would have more opportunity. Our business would flourish. We thought we could expand. The list goes on. It is a normal idea to believe that anywhere but where you are is going to be greater somehow. In many ways Raleigh was great, but the most important thing we learned while in Raleigh was that the grass isn’t greener on the other side. The night before we left Raleigh, Mike and I sat on the floor of our empty house eating leftover Thai food while Hayes slept. Our voices echoed in the empty house that felt so cold and far from our own anymore. While sitting there Mike said, you know the thing I realized while we lived here is that the grass is greenest where we water it. I sat and thought about this and in true Mike fashion he was right (I hate admitting it but he is right about 99.5% of the time). I had never thought about it. There I sat with chopsticks in hand enjoying leftover Pad Thai and realizing after these 3 years we kept believing that in some way things would be better somewhere else, but instead, you have a chance to dictate whether or not where you are is where the grass is greenest. Just like a plant some plants do better in different soil than others and just like each person is an individual there are different places that fit us better than others. Raleigh wasn’t the best soil for us to grow in, which is fine. But it took us 3 years away to realize that the best soil for us was back where we started. That that was the place we had to water and invest in in order to grow our strongest, fullest, and healthiest selves. Living here there are a lot of things we don’t have that are in stark difference to living in Raleigh where everything was at our fingertips. Life in Raleigh was easy even with a little traffic. Here though things have to be intentional especially with a 9-month-old. It takes 25+ minutes to get to a grocery store. There is no takeout within even a 10-minute drive. Our post office just around the corner is on a dirt road and only open from 10-2 every day. There is no big name shopping close by besides Target and TJ Maxx. 3 years ago it drove me nuts. All of it. I wanted more. I wanted things to be easy like they were in a big city, but after leaving here, I realized that what I needed most those places didn’t have which is the fact I look out our windows every day and it looks like a beautiful painting. The sounds we hear are birds, the wind, the ripple of the water, and the rustling of leaves more than cars or traffic. I no longer have to drive on a highway but instead take back roads that span through apple orchards, vineyards, and over hills that reveal amazing panoramic views of a lake that just fills me up every time. Life is harder here there is no doubt, but in many ways it is easier on our souls. It is greener here literally than it was back in Raleigh, but it is also metaphorically greener here for us because this is the place we are meant to flourish and grow. 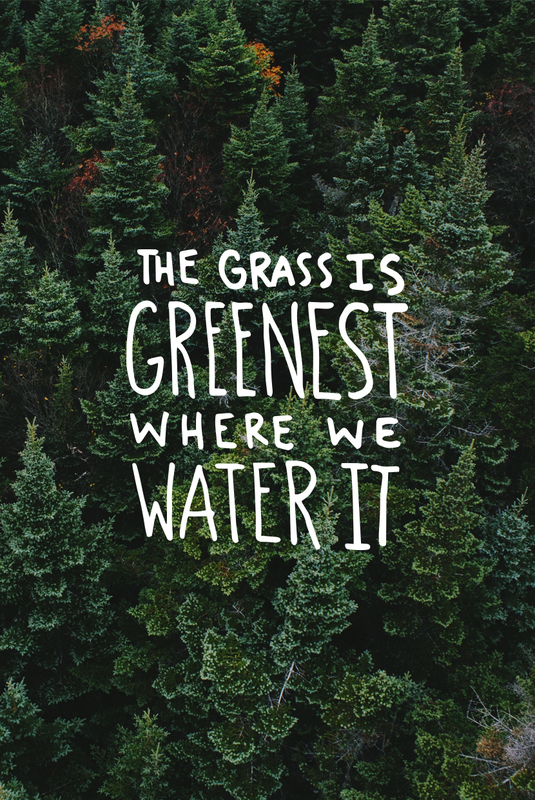 We love investing in those we love and want to grow here too because this is the place we have committed to be green for us. As we left Raleigh that day two months ago, me on a plane with Hayes and Mike in a car with our dogs, I kept thinking about how I planned to make it greener here for us. How I planned to make it greener for Hayes and how our business could make it greener for anyone we came in contact with. Find ways to invest, sow good in those around us, and care for everything that surrounds us, is now our daily goal. So, this week whenever you find yourself scrolling Instagram and wondering if the grass would be greener on the other side catch yourself and instead ask, how can I make things greener right where I am? Is your soil right for you? Have you given it your best effort to grow there? Happy Monday friends, may you have a week of flourishing! This is so true, and something I’ve learned very much over the past few years. Your 20’s make you realize these sorts of things, and that’s why they are so overwhelmingly difficult and overwhelmingly fulfilling at the same time. THanks for the reminder this morning. Gosh, I love this post, Megan. I was nodding along the entire way through. I’m so happy you guys have found home. ThanK you for this, megan! My husband and i are amidst our Raleigh equivalent right now–living in PhiladeLphia while he finishes his PhD, a city that neither of us loves–and it is so helpful to remember that we can find the green in our current life Here, even as we look aHead to our next chapter. You made my monday! What a message to start the week! Woohoo!!! I am so guilty of the “what if’s”! I am learning that maybe, just maybe if I can take it all in here, right here and enjoy it, then my greener place is always right here. thanks so much for this message and reminder! This was such a great post. I constantly find myself searching for the right place for me and my family. We have an 18 mo old son. Im from LA, my husband from Ireland. We met in Boston, moved to chicago and now are back in LA. I have been missing new england since we left. I have always felt that is my place but I worry that im just a grass is greener kind of girl. we have plans to move back in a little over a year. I’d love to hear more on how you were able to check your gut to make sure you were making the truly right move for you guys. I can’t wait to move back but i’m so scared i’ll wake up one day hating the cold and missing the constant heat of LA. I really want to put down roots and create a life for us, a community for my son to grow up in. I’m even stressed about finding the exact perfect town in MA. I love how open and honest these type of posts are. I think people are quick to think that moving is the only solution. I’m currently back at home after finishing university and although I see loads of people moving away, i’m trying to make the most of my current situation. I’m enjoying being close to family all the time, reconnecting with old friends and being able to freelance while living at home. Read this post a little late after catching up with your top life posts of 2016. I have been feeling this sentiment a lot lately. I love adventure, hiking, and being outdoors and, especially when it comes to instagram, there are so many beautiful places I yearn to see. However, where my husband and I live, in Southern Caliornia, we have some of the most beautiful beaches, mountains, and wild trails in the whole world. I still want to travel and see everything, but anytime I think that someone else is having more fun than I am because they can discover more new places, I remind myself how lucky I am to live in an area that is so beautiful every day of the year.